Hi there, and welcome to Flawed yet Functional! It is my goal to encourage you to eat healthy food and live a fulfilled life no matter your health issues. My current diet is the Autoimmune Protocol, and I have officially been on it for 190 days. Whoa! So you might say, I’ve found a few good recipes by now. With cooler temps coming, my favorite dinner is back on the table: soup. 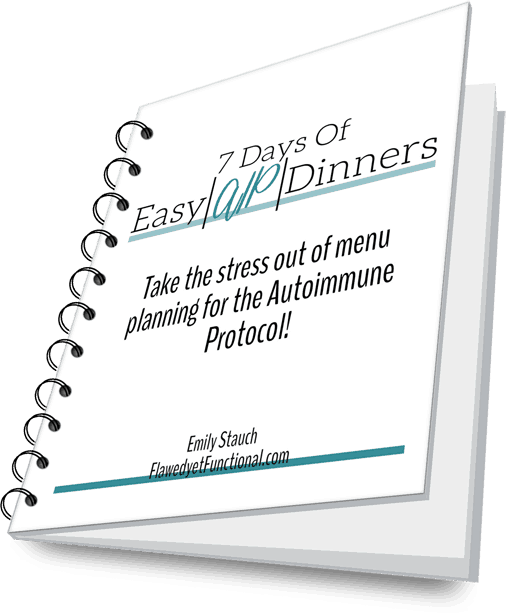 Today, I’d like to share my top 5 Autoimmune Protocol soup recipes. Even if the Autoimmune Protocol is not your diet, these soups are sure to please. Try one today! Looking for a hearty replacement to traditional potato soup? This chowder is full of onion-y, bacon flavor, and the parsnips provide a hearty filling main vegetable in the soup. It reheats wonderfully so you can make a big pot and enjoy it in your lunch for the rest of the week! Hands down, this soup is the most delicious in this list BUT is also the most prep heavy. It has 13 different vegetables in it! 13!! That’s a lot of chopping! On the bright side, the recipe makes a ton (Yay, leftovers! ), so I think the time spent chopping and cutting is well worth it. If you’re looking to add more variety of vegetables to your diet, this is one to try. I make this beef and sweet potato stew about twice a month during the fall/winter (Meaning I plan it every time I do my two week menu plan). It is hearty, filling and has all kinds of yummy toppings. I make this one in a regular dutch oven though as I do not have an instant pot. The cook time is longer, but the soup is no less delicious! Now for a soup that is more light while still being filling. The shiitake mushrooms stand out in this dish. Don’t substitute for other varieties! Well, if you can’t get shiitakes, then do that, but try it at least once with the correct variety. The flavor is so wonderful! I just love those mushrooms! Also, the blast of Asian goodness in our diet when so much Asian food is not AIP-friendly is so welcome. Seafood is something I’ve struggled to get into our diet more for budget reasons than disliking seafood reasons. This soup is light, lemony and delicious AND budget-friendly! I reduced the cost of this soup by using canned salmon. I just tossed it in at the end of the cooking time to warm it up (versus following the recipe’s instructions for a whole, raw fillet). It was still so good, but I bet a fresh salmon fillet would be even better! 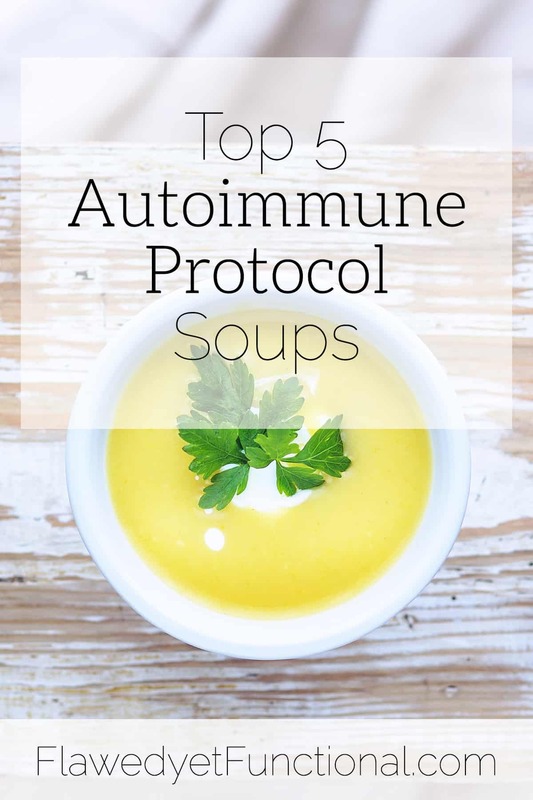 These are my top 5 Autoimmune Protocol soup recipes that I’ve tried. Soup is the best meal in the fall, winter, spring. Heck, if it’s a light soup (Pho or Salmon Chowder above), I even make it in the summer! Making a large pot of soup is easy, makes great leftovers, and provides tons of vegetables. So it is a mainstay in our house. What is your go-to fall/winter meal? Looking for more Tried & True AIP Recipes? Try these!